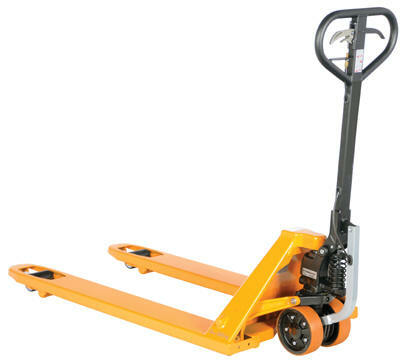 Anyone who has operated a fully loaded pallet truck knows the most strenuous part is starting the wheels rolling. 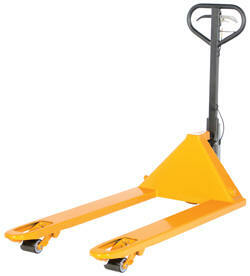 These Pallet Trucks solve the back breaking problem. the hand-grip and pumping the handle, the truck will move in a reverse direction. 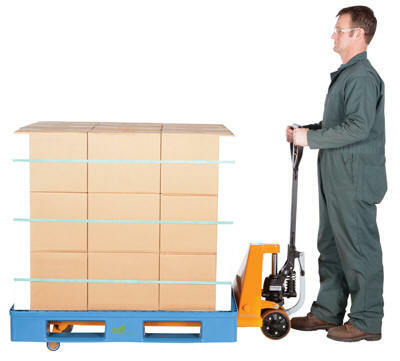 When the hand-grip is in the downward position, raising the handle will propel the truck to move in a forward direction (direction of the forks), thus reducing the pushing/pulling force. Model PM5-2748-ER-Y: Once powered drive is engaged by oscillating handle up and down, the truck accelerates with a minimum of operation force. 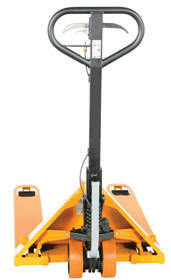 Ideal in confined spaces making horizontal transportation of heavy loads easy and safe.